KARIEGA GAME RESERVE PAYS TRIBUTE…. Kariega Game Reserve pays tribute on one year anniversary of poached rhino‘s death & celebrates a feisty lady. Monday, 25 March, Kariega Game Reserve held a tribute to commemorate the death of one of three rhinos poached just over a year ago. 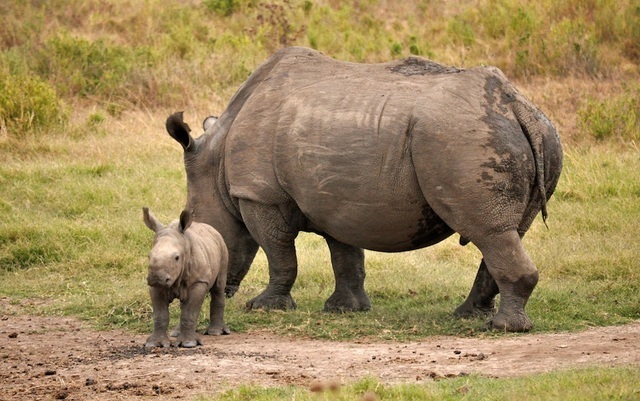 On 2 March 2012, three rhino were poached at Kariega. Dr William Fowlds, well-known wildlifeveterinary surgeon, was called to the scene to find two bulls and a cow affected. The older bull had died, and the young bull and cow were still alive. Dr Fowlds, along with his team, tended to these two rhino with assistance provided by Chipembere Rhino Foundation, which donated tracking and GPS satellite collars so that these animals could be located on an hourly basis. Themba, the young bull, survived for 24 days but finally lost his fight forlife on 25 March. Thandi, the only femaie, survived. Her struggle to overcome her injuries beating all the odds, and her remarkable recovery has made her a beacon of hope for her species. Team Kariega, along with Dr William Fowlds, issued daily blogs, sharing the treatment progress and the ups and downs for an increasing number of followers. Because of this much good came out of telling this sad story to convey the reality about modern poaching. The story was followed by media and readers around the world, not only creating an awareness aboutwhat was happening to rhinos in Africa, but it mobilized individuals to respond in their own way. Some examples of initiatives that come out of this incident include the Rhino Run, a South African national trail run held on World Rhino Day, the Rooting-for-Rhino Challenge, a Facebook site encouraging schools to form, photograph and upload their own “human rhino” image, uniting against rhino poaching. Creating awareness and raising funds for the protection of rhino via the Chipembere, Rhino Foundation in support of Dr Fowlds’ survivor rehabilitation via Wilderness Foundation and Bongi’s Quest for conservation education. The surge in rhino poaching has continued into 2013 and current statistics reflect that already over 160 rhinos have been lost to poaching to date! This entry was posted in Rhinos, Wild Species and tagged Africa, Facebook, Kariega Game Reserve, Kruger National Park, Poaching, Rhinoceros. Bookmark the permalink. 2 Responses to KARIEGA GAME RESERVE PAYS TRIBUTE….